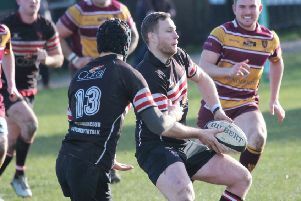 Old Brodleians made it four wins in a row in 2019 with a 21-13 success at Keighley on Saturday. They were making it a double over their West Yorkshire rivals, having won the home fixture 32-7 in October, and they stay seventh in Yorkshire One. High winds and rain in Halifax threatened to spoil this fixture but their were lighter winds and higher clouds at Utley with intermittent sunshine showing the artificial pitch off at its best. The visitors’ team was much-changed from the home win over Old Crossleyans. Matt Hoyle is injured and Alex Murphy, Danny Vento and Alex Dawson had work commitments. Coach Ollie Akroyd was named on the bench along with prop Callum Thompson. Keighley kicked off with the wind behind them and antipodean Hugh Sterndale-Smith waxs the referee. The first quarter was all kick and thrust by both sides, Brods clearing to touch and driving strongly. However,once Keighley gained possession their stand off kicked well from hand to gain field position. Brods were driven back at the first scrum and penalised but the shot at goal was missed. The visitors lost possession at the second scrum and were penalised for collapsing at the third. A heavy rain squall affected handling but Keighley used a number of close drives with some short passing to score in the corner after a long cut out pass to the left winger. The conversion was missed but Keighley led 5-0 after 25 minutes. Gareth Moger was replaced by Thompson in the front row. Rob Jennings pulled off a great tackle after a good break by the Keighley No 10 and Michael Briggs produced an excellent 50 metre run, bowling over one would-be tackler. Jennings then made a good break from a Thompson pass which resulted in Joe Kafatolu, probably Brods’ best player on the day, being held up short. From the scrum Brods were awarded a penalty try to take a 7-5 lead after 35 minutes. Keighley regained the lead from the restart with a penalty but Brods kicked a penalty to the corner and from the resulting catch and drive Joe Kafatolu touched down. Phil Town’s wonderful conversion from way out made it 8-14. Keighley had a man sent to the sin bin and a now dominant Brods scrum gained possession for Jennings to make 50 metres on a lovely run before passing to Town. Potter then put Keighley back in their 25. After a long period of attacking play by Keighley and good Brods defence, Town made a great tackle and when Keighley coughed up the ball Jimmy Hodkinson cleared to touch. After a series of lineouts and scrums, Briggs was held up near the line. Brods forced a five metre attacking scrum but the ball was turned over and when Keighley gained good ground, Matt Carbutt was sin-binned for a deliberate knock on. A good Briggs tackle prevented a try but resurgent Keighley kept up the pressure and the winger scored in the left corner. With their tails up, Keighley punched holes in the Brods defence and Pete Williams was sin-binned for a high tackle. However, Brods’ 13 produced some fine tackling and a resolute defence. Great runs from Thompson and Bennie Pritchett plus an off-load to Town gained late field position in the Keighley 25.